We are paid on a fee-only basis, which minimizes potential conflicts of interest. This means we are paid directly by our Clients. We do not accept commissions on any products or services that we might recommend. We are paid for advice and judgement, not the sale of financial products. Hourly Retainer: This service is ideal for those clients that need to make decisions that, in general, do not require preparation of detailed financial strategies and/or on-going investment management. For example, a client may receive a pension plan cash buyout offer. Should he/she take the cash or the annuity option? The rate for this level of service is $275 per hour, billed in 10 minute increments. Limited Retainer: This option is often chosen by clients who like to manage their own affairs, but want some guidance and/or a second opinion. These clients do NOT want to meet regularly with us. Instead, they want us to prepare their financial plans, and explain the strategies to them. These clients assume all responsibility for the implementation and monitoring of their plans. Our Limited Retainer services may include a Retirement Income Strategy, and an Investment Strategy. The fee may range from $1,500 to $4,000 depending on the complexity of planning and the value of the services rendered. This fee includes the Financial Plan data collection and development hours as well as the time to review the resultant strategies; however, implementation of the Financial Plan is not included. We will quote a specific fee for you once we understand the scope of services to be provided. These fees may be waived in full, or on a partial basis, at the discretion of the advisor, especially for those who engage us for our Investment Management services. Annual Retainer: This option, like the Limited Retainer, is often chosen by clients who like to manage their own affairs, but want some guidance and/or a second opinion. However, some clients want to meet regularly with us, so they choose the Annual Retainer model. The fee can range from $2,500 to several thousand dollars, depending on the complexity of the issues, time and value. It is billed on a quarterly basis. We may or may not assist you with the implementation of any recommendation. One time account set-up fee:This fee is a one-time charge of $1,250 which is assessed upon signing the agreement. This fee makes a contribution towards setting up the account (s) in our record keeping system and at the account Custodian. This fee may be waived at the discretion of the advisor, in particular, if the client has already paid a fee for the development of an Investment Strategy. 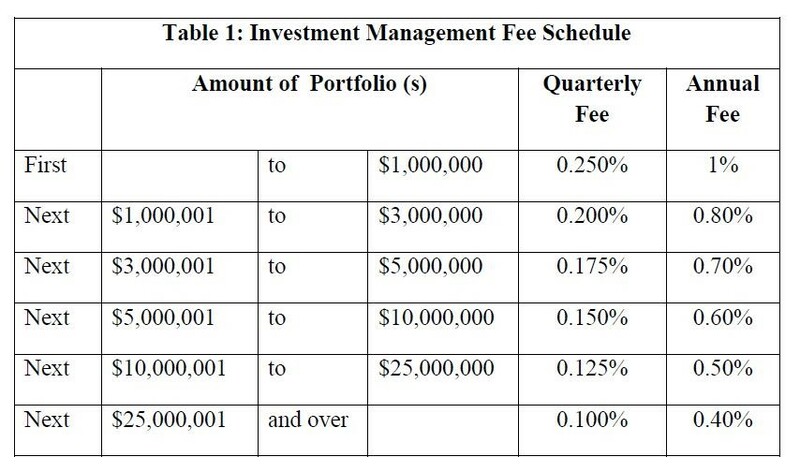 Investment management fee: For the accounts for which the Client has agreed to have the Advisor provide investment management services, and where the Advisor has been granted either Trading or Non-Trading Authority, the fee is based on the sliding scale shown in Table 1. The minimum level of assets to be managed is $200,000 and the minimum annual fee is $2,000 for investment management services. The level of assets and the fee minimums are negotiable or may be waived at our discretion. Combination: Some clients may choose an array of our services, and may opt to pay for these using a combination of fee arrangements. For any questions on our fees, please contact us at 714-771-6000 or by email at professor@Ulivi.com.